How to drive traffic to your website? How to promote blog pages on Instagram? How to get more followers on Instagram? How to improve traffic conversations? How to convert readers to followers? These are the most asking questions I am going to talking about here on this page. As you know, Instagram has 312 million active users monthly. That means you have big chances for getting served by the quality traffic. With your all skills, you can redirect those active but targeted people to your blog or website. These days Instagram is recommended as the trending visual social media tool and has been grown as the best digital marketing platform for many online publishers. Just add link on Instagram post and by having a business account for your website on the Instagram you can grab the attention of millions of people every day. By posting photos, videos you can convert those people into followers and followers into customers. Instagram is far better for improving brand visibility. With Instagram, you can not only drive traffic to your website but can build a community and can have strong customer support. You can experience improved visibility for your brand because of the Instagram as compared to any other social networking channel. If you required using the social media to promote your blog posts and quickly drive the users to visit your site; then Instagram is the best place to do this. Learn to use Instagram to promote your brand. More traffic means more page views; more page views cause more ad impressions, and so the Adsense publishers also able to generate more Adsense revenue. How to drive website traffic Well, it is a challenging process to divert the traffic flow towards your brand from Instagram. If you are struggling to direct the millions of Instagram followers to your website, here are some tips. These tips can help you increase traffic for your website, and you can experience a stronger brand presence on Instagram. 1. Create & develop your brand identity on Instagram. The initial step you require to take is creating an identity for your brand on Instagram. Just like other social networking channel demands, you need to first create a compelling bio on Instagram. Create the Instagram profile by adding your profile photo, small but rich bio & don't forget to add a link to your blog or website. To bring uniqueness to your bio, you can upload the emojis and creative fonts that relate and represent your brand. Also, make sure to include your unique hashtag(s) in your Instagram bio, so every new follower gets to know where to get started. This way, you might build some community with targeted hashtags that will further attract more audience to your site. Bio makes more authenticated & valid service provider for your brand & whatever you deliver to your clients. 2. Promote Instagram on your blog/website. In order to get more blog traffic from Instagram, you can add an Instagram feed to the landing page or side panel of your web page. Or the alternate way is dedicating the entire page to Instagram. The photos and images you share on Instagram, Be sure to showcase your IG work on your website too. By adding Instagram on your blog or website as a widget, you can able to drive extra attention and allow you blog readers to get more not from just words on the page. While you on-the-go, you may click pics using an Instagram mobile app, edit and post it on you IG profile. As the Instagram widget is also added to your landing page, those visitors who aren't yet followers could also get benefits from your posting. 3. Include links to Instagram photos. In the bio section of the Instagram, you can add a link to a blog or landing page of your website. Instagram allows you to put an active link in the biography section. Whenever the Instagram follower visits your brand on Instagram, he can click on the link and then drive towards the blog post. Also, be sure to link each of the photo and images of the products posted on your Instagram account. This will make the follower to visit your website and blog and you will have a massive traffic for the website. If you know their meaning and get how to use them, hashtags are a great technique to help you drive the targeted audience to your page. Hashtags are of top concern for any social network and especially for Instagram. They are the ultimate key drivers of the traffic towards the blog or website. Using Hashtags, you can achieve improved brand exposure. In order to get more and targeted traffic from Instagram, it is recommended to include relevant #Hashtags. Be sure to add trending Hashtags on Instagram. Also, you can add new Hashtags with added creativity. The high quality of your content is not only necessary for engaging readers but also helps drive traffic, improve online visibility and get conversions and sells on a regular basis. Great photos and images always attract the visitor. Candid shots are always engaging and can take the brand name on top position. Impressive photos and images with captivating calls-to-action make the user click on the landing page of the website. You can take advantage of this facility on Instagram. Keep adding the pictures of your products and add contrast to grab the attention of the visitor. You can add creativity to the images along with the carefully crafted background. Showcasing the images of your brand can help to grab the attention of the readers. Link your website or blog with these photos and images and get the whole traffic diverted towards your blog and website. 6. Use creative videos on the Instagram. Along with the images and photos related to your business, it is great to add videos on Instagram. For this, you can use how-to videos, show celebrations, greeting videos, and so on. The quality and engaging videos can help you to connect with your new as well as existing audience and let them visit your blog post for more details. 7. Share the event on the Instagram. If you are planning to host any event or sale, post or share it on the Instagram. This will create engagement and excitement which in turn will encourage the users to visit your website for in-depth information. It's the best example of call-to-action. 8. Promote the details of the contest. Instagram is the ultimate platform with millions of followers. The photos, images, and videos shared on Instagram get viewed by maximum users as compared to other social networks. So, if you are planning to host any contest or competition, let your Instagram followers know about the same. Share the images of your contest, game, giveaways along with the detailed description on the Instagram. Whenever you share the contest detail on Instagram, link your Instagram profile to the landing page of your blog or website. This will help you to get more blog traffic and getting new followers easier through Instagram. 9. Before IG, write quality blog pages. The content of the blog always matter. You should be very careful & attentive while writing the blog post. Make it unique, fresh, informative, entertaining, engaging and appealing not only according to the niche but also the user's point of view. You can add photos and videos in your blog post to increase its visibility. Visual contents speak more than just words. 10. Share photos from the blog pages. As you know, to make the blog more appealing, it is recommended to add images and photos to it. You can share the same photo on Instagram and link it towards the blog. You can add typography and include a call-to-action about the post. 11. Be active And engaging. Instagram serves more than 312 million followers every day. So, just imagine, if you keep yourself active, you can drive this huge traffic towards your blog. If you really want to grow your audience, Instagram is the right place for you. You can create your brand name & build fame through Instagram. You must need to be open, active and engaging with your audience. You need to share the fresh content on a regular basis. You can respond to the comment you receive for your post. You can even comment on other people’s post to build the talking community. This way you can remain active and be engaging on the Instagram. 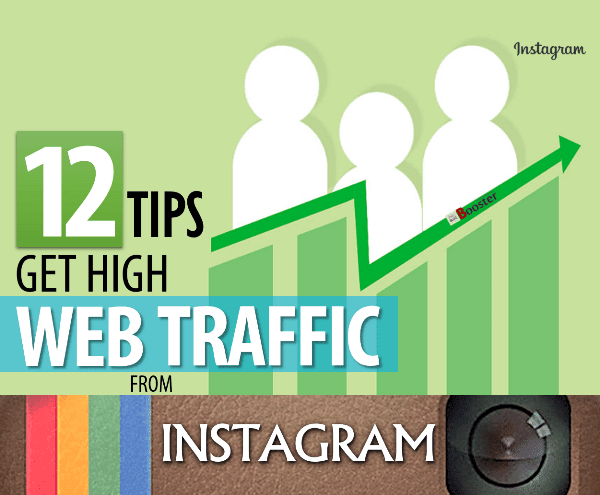 This will surely help you to drive more traffic to your blog and website from Instagram. 12. Invest in Instagram ads. I'm not recommending, but you can. This is the recently announced feature of Instagram. By investing in Instagram ads, you can target the right audience and drive more traffic towards the blog post and landing page. Instagram is the very active and on-fire social networking platform. It has over million of followers. Such a huge platform definitely serves a treat of targeted audience. By remaining active on Instagram, it is very easy to drive more and more traffic for the blog post. For better content marketing; you can use this ultimate platform in smart ways as mentioned above to attend target audience for your business products. By posting new & updated blog pages, adding catchy images, captivating videos, commenting, responding, hosting the contest, etc. surely, you can get massive traffic. Indeed, Instagram is the most perfect address to promote your brand. From my own experience, it is the ideal place to get target audience for your every blog post.